“Guts” redirects here. For other uses, see Guts (disambiguation). 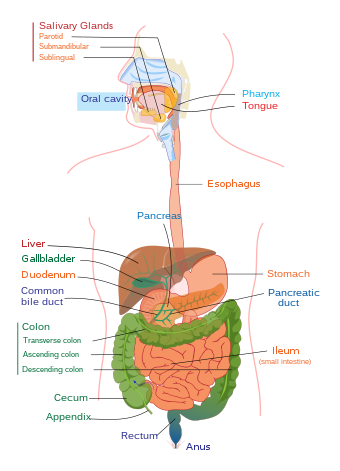 The upper gastrointestinal tract consists of the mouth, pharynx, esophagus, stomach, and duodenum. The exact demarcation between the upper and lower tracts is the suspensory muscle of the duodenum. This differentiates the embryonic borders between the foregut and midgut, and is also the division commonly used by clinicians to describe gastrointestinal bleeding as being of either “upper” or “lower” origin. Upon dissection, the duodenum may appear to be a unified organ, but it is divided into four segments based upon function, location, and internal anatomy. The four segments of the duodenum are as follows (starting at the stomach, and moving toward the jejunum): bulb, descending, horizontal, and ascending. The suspensory muscle attaches the superior border of the ascending duodenum to the diaphragm. Duodenum: A short structure (about 20–25 cm long) which receives chyme from the stomach, together with pancreatic juice containing digestive enzymes and bile from the gall bladder. The digestive enzymes break down proteins, and bile emulsifies fats into micelles. The duodenum contains Brunner’s glands which produce a mucus-rich alkaline secretion containing bicarbonate. These secretions, in combination with bicarbonate from the pancreas, neutralize the stomach acids contained in the chyme. The main function of the large intestine is to absorb water. The area of the large intestinal mucosa of an adult human is about 2 m2. The gut is an endoderm-derived structure. At approximately the sixteenth day of human development, the embryo begins to fold ventrally (with the embryo’s ventral surface becoming concave) in two directions: the sides of the embryo fold in on each other and the head and tail fold toward one another. The result is that a piece of the yolk sac, an endoderm-lined structure in contact with the ventral aspect of the embryo, begins to be pinched off to become the primitive gut. The yolk sac remains connected to the gut tube via the vitelline duct. Usually this structure regresses during development; in cases where it does not, it is known as Meckel’s diverticulum. Beneficial bacteria also can contribute to the homeostasis of the gastrointestinal immune system. For example, Clostridia, one of the most predominant bacterial groups in the GI tract, play an important role in influencing the dynamics of the gut’s immune system. It has been demonstrated that the intake of a high fiber diet could be the responsible for the induction of T-regulatory cells (Tregs). This is due to the production of short-chain fatty acids during the fermentation of plant-derived nutrients such as butyrate and propionate. Basically, the butyrate induces the differentiation of Treg cells by enhancing histone H3 acetylation in the promoter and conserved non-coding sequence regions of the FOXP3 locus, thus regulating the T cells, resulting in the reduction of the inflammatory response and allergies. Health-enhancing intestinal bacteria of the gut flora serve to prevent the overgrowth of potentially harmful bacteria in the gut. These two types of bacteria compete for space and “food,” as there are limited resources within the intestinal tract. A ratio of 80-85% beneficial to 15–20% potentially harmful bacteria generally is considered normal within the intestines. Enzymes such as CYP3A4, along with the antiporter activities, are also instrumental in the intestine’s role of drug metabolism in the detoxification of antigens and xenobiotics. Inflammatory bowel disease is an inflammatory condition affecting the bowel walls, and includes the subtypes Crohn’s disease and ulcerative colitis. While Crohn’s can affect the entire gastrointestinal tract, ulcerative colitis is limited to the large intestine. Crohn’s disease is widely regarded as an autoimmune disease. Although ulcerative colitis is often treated as though it were an autoimmune disease, there is no consensus that it actually is such. Helicobacter pylori is a gram-negative spiral bacterium. Over half the world’s population is infected with it, mainly during childhood; it is not certain how the disease is transmitted. It colonizes the gastrointestinal system, predominantly the stomach. The bacterium has specific survival conditions that our gastric microenvironment: it is both capnophilic and microaerophilic. Helicobacter also exhibits a tropism for gastric epithelial lining and the gastric mucosal layer about it. Gastric colonization of this bacterium triggers a robust immune response leading to moderate to severe inflammation. Signs and symptoms of infection are gastritis, burning abdominal pain, weight loss, loss of appetite, bloating, burping, nausea, bloody vomit, and black tarry stools. Infection can be detected in a number of ways: GI X-rays, endoscopy, blood tests for anti-Helicobacter antibodies, a stool test, and a urease breath test (which is a by-product of the bacteria). If caught soon enough, it can be treated with three doses of different proton pump inhibitors as well as two antibiotics, taking about a week to cure. If not caught soon enough, surgery may be required. Enteroviruses are named by their transmission-route through the intestine (enteric meaning intestinal), but their symptoms aren’t mainly associated with the intestine. Intestines from animals other than humans are used in a number of ways. From each species of livestock that is a source of milk, a corresponding rennet is obtained from the intestines of milk-fed calves. Pig and calf intestines are eaten, and pig intestines are used as sausage casings. Calf intestines supply calf-intestinal alkaline phosphatase (CIP), and are used to make goldbeater’s skin. The use of animal gut strings by musicians can be traced back to the third dynasty of Egypt. In the recent past, strings were made out of lamb gut. With the advent of the modern era, musicians have tended to use strings made of silk, or synthetic materials such as nylon or steel. Some instrumentalists, however, still use gut strings in order to evoke the older tone quality. Although such strings were commonly referred to as “catgut” strings, cats were never used as a source for gut strings. Gut cord has also been used to produce strings for the snares that provide a snare drum‘s characteristic buzzing timbre. While the modern snare drum almost always uses metal wire rather than gut cord, the North African bendir frame drum still uses gut for this purpose. “Natural” sausage hulls, or casings, are made of animal gut, especially hog, beef, and lamb. Chitterlings, a kind of food, consist of thoroughly washed pig‘s gut. ^ Ruppert EE, Fox RS, Barnes RD (2004). “Introduction to Eumetazoa”. Invertebrate Zoology (7 ed.). Brooks / Cole. pp. 99–103. ISBN 978-0-03-025982-1. ^ Ruppert EE, Fox RS, Barnes RD (2004). “Introduction to Bilateria”. Invertebrate Zoology (7 ed.). Brooks / Cole. pp. 203–205. ISBN 978-0-03-025982-1. ^ G., Hounnou; C., Destrieux; J., Desmé; P., Bertrand; S., Velut (2002-12-01). “Anatomical study of the length of the human intestine”. Surgical and Radiologic Anatomy. 24 (5): 290–294. doi:10.1007/s00276-002-0057-y. ISSN 0930-1038. PMID 12497219. ^ Raines, Daniel; Arbour, Adrienne; Thompson, Hilary W.; Figueroa-Bodine, Jazmin; Joseph, Saju (2014-05-26). “Variation in small bowel length: Factor in achieving total enteroscopy?”. Digestive Endoscopy. 27 (1): 67–72. doi:10.1111/den.12309. ISSN 0915-5635. PMID 24861190. ^ Lin, L; Zhang, J (2017). “Role of intestinal microbiota and metabolites on gut homeostasis and human diseases”. BMC Immunology. 18 (1): 2. doi:10.1186/s12865-016-0187-3. PMC 5219689. PMID 28061847. ^ Marchesi, J. R; Adams, D. H; Fava, F; Hermes, G. D; Hirschfield, G. M; Hold, G; Quraishi, M. N; Kinross, J; Smidt, H; Tuohy, K. M; Thomas, L. V; Zoetendal, E. G; Hart, A (2015). “The gut microbiota and host health: A new clinical frontier”. Gut. 65 (2): 330–339. doi:10.1136/gutjnl-2015-309990. PMC 4752653. PMID 26338727. ^ Clarke, Gerard; Stilling, Roman M; Kennedy, Paul J; Stanton, Catherine; Cryan, John F; Dinan, Timothy G (2014). “Minireview: Gut Microbiota: The Neglected Endocrine Organ”. Molecular Endocrinology. 28 (8): 1221–38. doi:10.1210/me.2014-1108. PMC 5414803. PMID 24892638. ^ “Length of a Human Intestine”. Retrieved 2 September 2009. ^ Kapoor, Vinay Kumar (13 Jul 2011). Gest, Thomas R., ed. “Large Intestine Anatomy”. Medscape. WebMD LLC. Retrieved 2013-08-20. ^ Gray, Henry (1918). Gray’s Anatomy. Philadelphia: Lea & Febiger. ^ a b Drake, Richard L.; Vogl, Wayne; Tibbitts, Adam W.M. Mitchell; illustrations by Richard; Richardson, Paul (2015). Gray’s anatomy for students (3rd ed.). Philadelphia: Elsevier/Churchill Livingstone. p. 312. ISBN 978-0-8089-2306-0. ^ a b c Sarna, S.K. (2010). “Introduction”. Colonic Motility: From Bench Side to Bedside. San Rafael, California: Morgan & Claypool Life Sciences. ISBN 9781615041503. ^ “The human proteome in gastrointestinal tract – The Human Protein Atlas”. www.proteinatlas.org. Retrieved 2017-09-21. ^ Gremel, Gabriela; Wanders, Alkwin; Cedernaes, Jonathan; Fagerberg, Linn; Hallström, Björn; Edlund, Karolina; Sjöstedt, Evelina; Uhlén, Mathias; Pontén, Fredrik (2015-01-01). “The human gastrointestinal tract-specific transcriptome and proteome as defined by RNA sequencing and antibody-based profiling”. Journal of Gastroenterology. 50 (1): 46–57. doi:10.1007/s00535-014-0958-7. ISSN 0944-1174. PMID 24789573. ^ Ghoshal, U. C.; Sengar, V.; Srivastava, D. (2012). “Colonic Transit Study Technique and Interpretation: Can These be Uniform Globally in Different Populations with Non-uniform Colon Transit Time?”. Journal of Neurogastroenterology and Motility. 18 (2): 227–228. doi:10.5056/jnm.2012.18.2.227. PMC 3325313. PMID 22523737. ^ Mowat, Allan M.; Agace, William W. (2014-10-01). “Regional specialization within the intestinal immune system”. Nature Reviews. Immunology. 14 (10): 667–685. doi:10.1038/nri3738. ISSN 1474-1741. PMID 25234148. ^ Helander, Herbert F.; Fändriks, Lars (2014-06-01). “Surface area of the digestive tract – revisited”. Scandinavian Journal of Gastroenterology. 49 (6): 681–689. doi:10.3109/00365521.2014.898326. ISSN 1502-7708. PMID 24694282. ^ Flannigan, Kyle L.; Geem, Duke; Harusato, Akihito; Denning, Timothy L. (2015-07-01). “Intestinal Antigen-Presenting Cells: Key Regulators of Immune Homeostasis and Inflammation”. The American Journal of Pathology. 185 (7): 1809–1819. doi:10.1016/j.ajpath.2015.02.024. ISSN 1525-2191. PMC 4483458. PMID 25976247. ^ Sánchez de Medina, Fermín; Romero-Calvo, Isabel; Mascaraque, Cristina; Martínez-Augustin, Olga (2014-12-01). “Intestinal inflammation and mucosal barrier function”. Inflammatory Bowel Diseases. 20 (12): 2394–2404. doi:10.1097/MIB.0000000000000204. ISSN 1536-4844. PMID 25222662. ^ Schubert, Mitchell L. (2014-11-01). “Gastric secretion”. Current Opinion in Gastroenterology. 30 (6): 578–582. doi:10.1097/MOG.0000000000000125. ISSN 1531-7056. PMID 25211241. ^ Márquez, Mercedes; Fernández Gutiérrez Del Álamo, Clotilde; Girón-González, José Antonio (2016-01-28). “Gut epithelial barrier dysfunction in human immunodeficiency virus-hepatitis C virus coinfected patients: Influence on innate and acquired immunity”. World Journal of Gastroenterology. 22 (4): 1433–1448. doi:10.3748/wjg.v22.i4.1433. ISSN 2219-2840. PMC 4721978. PMID 26819512. ^ Furusawa, Yukihiro; Obata, Yuuki; Fukuda, Shinji; Endo, Takaho A.; Nakato, Gaku; Takahashi, Daisuke; Nakanishi, Yumiko; Uetake, Chikako; Kato, Keiko; Kato, Tamotsu; Takahashi, Masumi; Fukuda, Noriko N.; Murakami, Shinnosuke; Miyauchi, Eiji; Hino, Shingo; Atarashi, Koji; Onawa, Satoshi; Fujimura, Yumiko; Lockett, Trevor; Clarke, Julie M.; Topping, David L.; Tomita, Masaru; Hori, Shohei; Ohara, Osamu; Morita, Tatsuya; Koseki, Haruhiko; Kikuchi, Jun; Honda, Kenya; Hase, Koji; Ohno, Hiroshi (2013). “Commensal microbe-derived butyrate induces the differentiation of colonic regulatory T cells”. Nature. 504 (7480): 446–450. doi:10.1038/nature12721. PMID 24226770. ^ Jakoby, WB; Ziegler, DM (5 December 1990). “The enzymes of detoxication”. The Journal of Biological Chemistry. 265 (34): 20715–8. PMID 2249981. ^ Nitzan, Orna; Elias, Mazen; Peretz, Avi; Saliba, Walid (2016-01-21). “Role of antibiotics for treatment of inflammatory bowel disease”. World Journal of Gastroenterology. 22 (3): 1078–1087. doi:10.3748/wjg.v22.i3.1078. ISSN 1007-9327. PMC 4716021. PMID 26811648. ^ Wier LM, Steiner CA, Owens PL (February 2015). “Surgeries in Hospital-Owned Outpatient Facilities, 2012”. HCUP Statistical Brief #188. Rockville, MD: Agency for Healthcare Research and Quality. ^ Fox, James; Timothy Wang (January 2007). “Inflammation, Atrophy, and Gastric Cancer”. Journal of Clinical Investigation. review. 117 (1): 60–69. doi:10.1172/JCI30111. PMC 1716216. PMID 17200707. Retrieved 19 May 2014. ^ Murphy, Kenneth (20 May 2014). Janeway’s Immunobiology. New York: Garland Science, Taylor and Francis Group, LLC. pp. 389–398. ISBN 978-0-8153-4243-4. ^ Hiskey, Daven. “Violin strings were never made out of actual cat guts”. TodayIFoundOut.com. Retrieved 15 December 2015. ^ “World’s oldest condom”. Ananova. 2008. Retrieved 2008-04-11.